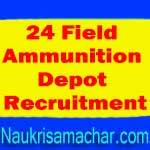 24 Field Ammunition Depot Recruitment 2018 – 125 Tradesman Mate, LDC & Other Posts:- Ministry of Defence, 24 Field Ammunition Depot has issued notification for the recruitment of 125 posts of Material Assistant, LDC, Fireman & Tradesman Mate. Interested & eligible candidates can apply in prescribed application format within 21 days from the date of publication of advertisement in the Employment News. For Material Assistant: Graduate in any discipline from any recognized University or Diploma in Material Management or Diploma in Engineering in any Discipline from any recognized Institution. For LDC :12th Class Pass or equivalent from a recognized board. Typing Proficiency – English typing @ 35 words per minute on computer or Hindi typing @ 30 words per minute. For Fireman: Matriculation or equivalent from recognized board. For Tradesman Mate: 10th Class Pass or equivalent from a recognized board. Date of Publication in Employment News :10/02/2018 to 16/02/2018. Last Date : Within 21 Days from the Date of Publication. How to Apply: Interested eligible candidates can send their application in prescribed format along with all necessary documents through Ordinary/Registered/Speed Post to 24 FAD, PIN 909724, C/O 56 APO within 21 days from the date of publication of advertisement in the Employment News. Subscribe our Free Job Alert Mail Service for 24 Field Ammunition Depot Recruitment 2018.